A man named Lazarus was sick. He lived in Bethany with his sisters, Mary and Martha. This is the Mary who later poured the expensive perfume on the Lord's feet and wiped them with her hair. Her brother, Lazarus, was sick. While John tells us this story of Lazarus' sickness and death in today's verses and the following verses, this story is part of a much bigger story. Martha, Mary, and Lazarus are Jesus' disciples. Jesus knows them and loves them deeply. They love him and have chosen to follow him no matter the cost. Their loyalty and love are without fault. Yet Lazarus gets sick. Death comes to their door. Grief rips at their hearts. This story is also our story. We can listen to it and look and find our answers to life's most painful reality and several of life's most confusing questions. We are touched by Jesus and the simple, incomplete, and determined faith of these precious people. 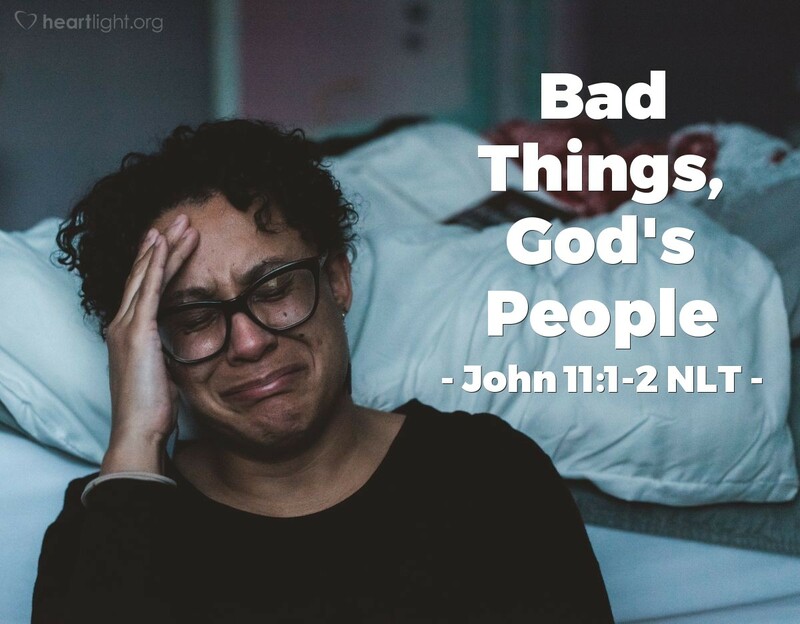 Bad stuff does happen to God's people, but Jesus will not allow the bad stuff to win! Jesus triumphs. Jesus is glorified. Those who love Jesus enjoy the reunion. Let your heart settle in this place for the next several days as we continue through the story. Drink deeply of Jesus' words. Let the questions, as well as the faith of Martha and Mary, become your own. Find hope and life here, for while dark days will come your way, Jesus has the final victorious word, and you will have the final joy! Father, please deepen my faith and stitch these words of faith and comfort on my heart these next several days walking with Martha, Mary, Lazarus, and Jesus. Give me hope beyond my fear of death and trust beyond my limited faith sight. In Jesus' name, I pray. Amen.